Moments before bursting in a dazzling fireball over southwestern Wisconsin, a likely meteor appears as a bright dot in the Wednesday night sky. This image was captured around 10:07 p.m., April 14 by a camera mounted on the northwest corner of the Atmospheric and Oceanic Sciences Building on the University of Wisconsin-Madison campus. A flash of light lit up the night sky when what was believedto be a space rock burst across southwestern Wisconsin on Wednesday, accordingto news reports. 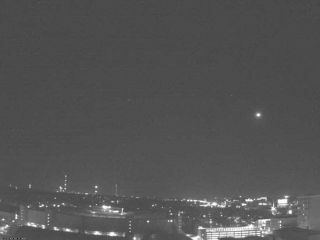 An image captured by a camera mounted on the northwestcorner of the Atmospheric and Oceanic Sciences Building on the University ofWisconsin-Madison campus shows the meteor as a bright dot moments beforebursting into a spectacular fireball. The photos were taken at around 10:07 p.m. on April 14.According to news reports, the burst illuminated clouds and the contrails ofairplanes, which is the visible concentration of water droplets from theatmosphere that occur in the wake of an aircraft under select conditions. The fireball was seen moving west to east, and was visibleacross northern Missouri, Illinois and Indiana, in addition to southernWisconsin, according to the National Oceanic and Atmospheric Administration(NOAA). NOAA also received several reports of a prolonged sonicboom from areas north of Highway 20, along with shaking homes, trees andvarious other objects. The fireball reportedly broke up into smaller pieces andwas lost from sight well before it reached the horizon, and it is unknownwhether any pieces of the object actually hit the ground. It does not take a large object to create a fireball in thenight sky. Most regular "shooting stars" are created by bits of cometdebris no larger than a sand grain. A space rock the size of a softball orbasketball can create a fireball. Objects as big as washing machines fall into Earth'satmosphere on a monthly basis, but most burn up before reaching the ground.Many of the resulting fireballs are not seen because they occur over remoteareas or over the ocean. Earth is more than two-thirdsocean.